The Thames is indeed a spooky, unsettling river. Monika Bobinska: “ I think of things like the Marchioness disaster or Malcolm Hardee’s drowning or that couple on a date on the boat or the Westminster bridge attack which all seem to bring that ancient frightening, unsettling, mythical aspect back to the now, in contrast to the Thames as a confident gateway to a mighty modern city with the Queen sailing down it.” Sarah Sparkes adds: The Thames has always been a major conduit for the movement of people and goods, bringing the other or the alien from overseas. It is a source of life – water – many people have and still live along its banks. It is also a potential source of death, many people have drowned in the Thames”. Artist Laura Marker, in a new work, focusses on drowning in those unsettling watery depths in 10 Days and Nights – thinking about the trope of the ‘drowned woman’ in works that are focussing on the river Thames as the location for the scene of tragedy; George Frederic Watts’ painting Found Drowned, Thomas Hood’s poem The Bridge of Sighs, and prints created for George Cruickshank’s book, The Drunkard’s Children. Works that depict The Drowned Woman are heavily romanticised visions of fantasy, with their all-too-familiar tragic subjects; youthful, beautiful, heavy with the symbolism of the ‘fallen’ woman”. Her work developed through research into both nineteenth century artistic responses, and journalistic writings featuring Thames side suicides, seeks to bring a more personal voice to The Drowned Women, uncovering their stories and ‘ghosts’ lost to time and lost to the Thames”. Davies, Monaghan and Klein, Heidi Wigmore and Anne Robinson also refer to drowning and losses at sea. This exhibition emphasises the power of objects to be imbued with empathetic energy, including things found floating in the Thames, like flotsam and jetsam. Charlie Fox has appeared in the persona of Sailor Forbes who, “as a long serving seasalt, has channelled the spirit of whalers, traders and the unrecuperated naval expeditions, that haunt the foreshore…He also hopes to be able reappear within the locale, to guide other lost souls and curious through the shipwrecks and detritus of Woolwich allowing the public to navigate the area as a spirit zone, filled with the flotsam and jetsam of a derelict limbo time”. 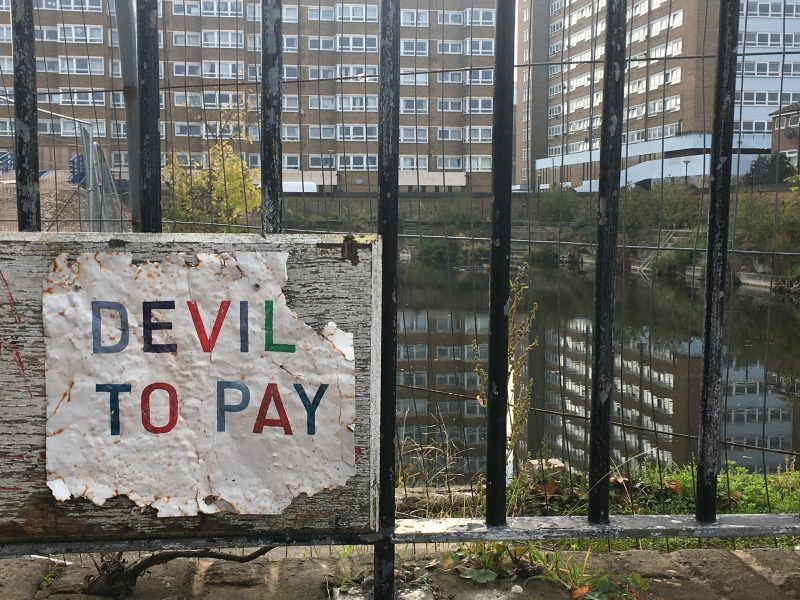 Charlie Fox is the instigator of Inspiral London – a collective spiral psycho-geographic walk which spirals from Nelson’s column to the M25. 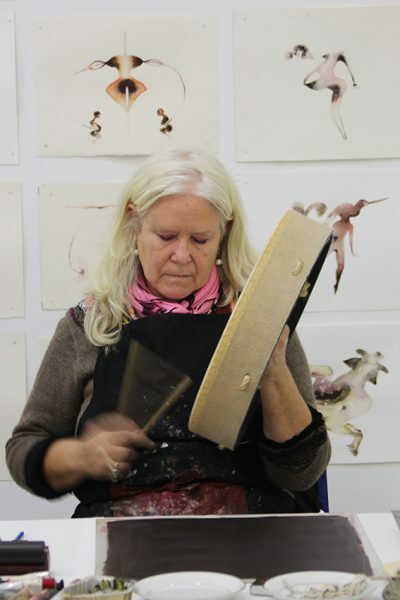 Diane Eagle’s work is inspired by ritual, emotional and spiritual investment in objects, healing and power, and the historic resonance within places. Her objects in Pipes is inspired by the Tooley Street/Joiner Street tobacco pipe found during the archaeological work carried out prior to the current development of London Bridge train station. These pipes mark the trade, industries and history particular to the London Bridge and Southbank area at the time when the station first opened in December 1836 – pipe maker, railway worker, coaching inn keeper, wool merchant, dissenter, Guy’s Hospital nurse, leather manufacture, hat maker, St. Olave’s Grammar School mistress, river boatman, rope maker, hop picker. 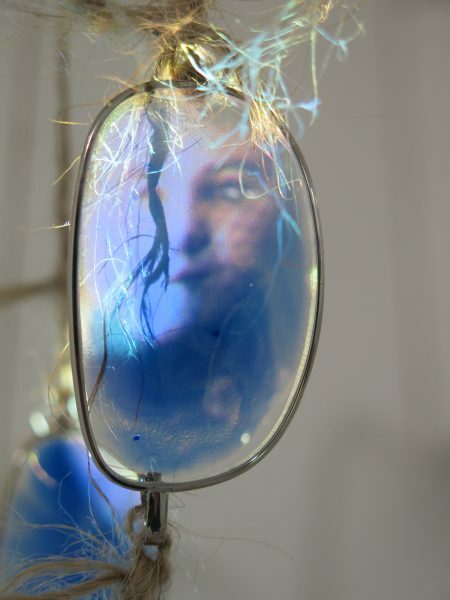 Jane Millar also is working with significant objects – in her case she is inspired by Dr John Dee’s scrying mirror in the British Museum. Obviously it would be impossible to get a loan of this, but her ceramic objects act similarly as ‘ghost vessels’ where the spirit is is “trapped within an object, and revered, or feared and abandoned”. Like artist/ curator Sarah Sparkes, she is also organising an exhibition coming soon, New Doggerland referencing that imaginary domain in the North Sea. 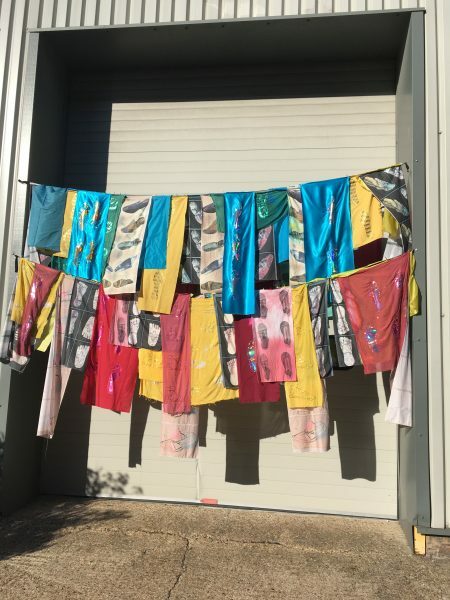 Heidi Wigmore, based in Leigh on Sea, in Prayer Flags is inspired by the leather shoes recently recovered from the wreck of the HMS London, with their powerful and intimate human imprints and which evoke the historic movement of people, often perilous, on the Thames and in and out of the estuary. Sarah Trillo, another estuary explorer, explores ancient landing sites in Thanet and celebrating the liminality of the tide which exposes these sites fleetingly. Apparently it was believed these liminal tidal sites were considered poisonous to snakes. Further afield, Kio Griffith, in Yugawara Elegy, explores remnants of a Japanese ghost town, recreating lost Inns, hot springs and arcades that had vanished. 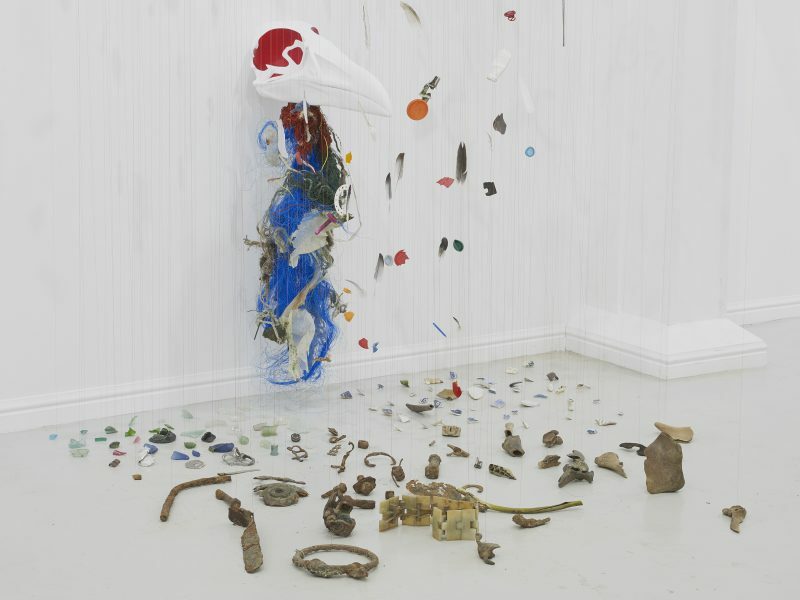 Miyuki Kasahara has used objects found and collected along the Thames foreshore to explore a Japanese Noh play Utoh about the ghost of a man who was once a seabird hunter. Kasahara: “A hunter imitated the sound of the parent in order to catch their young. In retribution for cruelly tricking so many, he was sent to hell when he died. In hell, Utoh became phantom- birds and continuously tormented him. He learnt that the birds he killed loved their families as much as he loved his own family. The parent birds weep tears of blood upon seeing their young taken, and hunters must wear large hats and raincoats as protection from falling tears, the touch of which causes sickness and death. In contemporary society, we don’t often kill seabirds directly like the hunter. However, almost all the seabird population has declined because of marine pollution. “As well as the found objects she has work tethered to a post on the foreshore, near the abandoned Mersey Ferry – the nearby ’Ghost Ship’ the Royal Iris – a past site for artists actions – so that it floats in the Thames with the rising and falling tide. “creating a gateway to the sea in order to evoke this ghostly tale”. There are also performances taking place around this wonderful vessel which haunts the Thames Barrier, notably Gen Doy’s Only Death (After Pablo Neruda) and referring to the deaths of migrants in the Mediterranean and in refugee camps. Katie Goodwin is also influenced by seabirds in her digital animation of ‘Martha’, the world’s last passenger pigeon who died in September 1914 at Cincinnati Zoo. According to the artist she was the last of her kind, despite once being the most abundant bird in the world, with an estimated population of 3 to 5 billion. It is said that when a flock flew over, the sky would turn black for several minutes. Despite their abundance, it is thought the North American bird species was lost due to overhunting and destruction of its natural habitat. 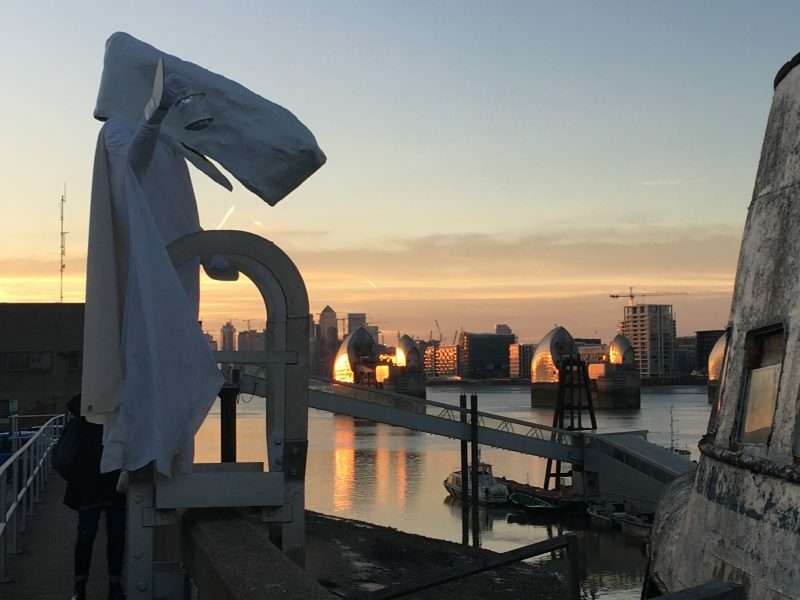 More wildlife enters The Ghost Tide with Calum F Kerr: “There have been sightings of a Ghostly White Cachalot (or Sperm Whale) by the Thames at Enderby’s Wharf, Greenwich and near the estuary at Gravesend. The unfortunate Bottle-nosed (Thames) Whale of 2006 passed both of these sites and Woolwich, on the way to its demise. Recently, the Ghostly Whale has been sighted near Thames-side and along the Thames Barrier path, lamenting whales lost in its waters. Sperm Whales communicate through echolocation, clicking noises that are the loudest sounds emitted by any animal – 230 decibels under water, equivalent to 170 decibels on land. The eerie sound of this communication with the living skirts the shorelines. This whale is beckoned by the spirits of the whalers and the destroyed industrial heritage of the Thames”. Moving back to objects, many artists have been influenced by Nigel Kneale’s (Quatermass and the Pit) 1972 television play The Stone Tape, which reflected a growing interest in the idea that objects or building could contain ghost ‘recordings’ or voices generated by traumatic events in the past. Sound artist Graham Dunning is no exception “I found a stone on the bank of the Thames which was similar in size to a cassette tape, so made an edition of copies of it. The original tape (master) is exhibited alongside one of the copies”. Another soundwork, by Neale Willis, also inspired by the history of psychical research, incorporates a ‘spirit trumpet’ of sorts, “metaphorically rising and floating around the room emitting ‘spirit voices’. As the machine performs its ‘trumpet séance’ voices are summoned telling stories of what is, what was and what has never been”. He is interested in the notion of Arthur Koestler’s ‘Ghost in he Machine’ through a technological seance, creating conflict between what enters the machine and what leaves it. 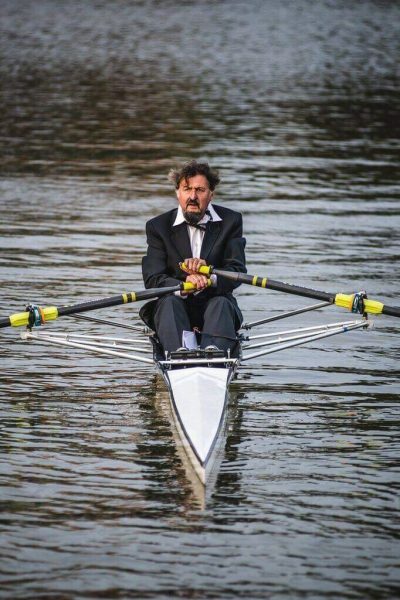 Mortality, leading out to the Thames, is explored by Toby McLennan in this evocative project about her father building a solar boat to cure himself, like a shaman. For this work she has built a ‘solar boat’ with the shape of a woman’s body (hers) within it, sailing through the mist, connecting to the shamanic belief that illness occurs when a person’s soul has wandered away, the shaman utilises the ship to sail out and retrieve the missing soul. She says “My father became ill with cancer and a brain tumour. He was depressed. He wouldn’t eat. He spent his days sleeping. Then one day he woke up and, struggling to sit up, he declared, ‘I have to build a boat.’ Knowing that my father couldn’t lift a hammer, my family shrugged off his proclamation as part of some delirium. However, I became convinced that my father, like a shaman, was trying to build a solar boat to save his life My father survived that immediate ordeal. In my work, Canoewoman, a canoe and I are one in the same. It was created in thanks to my father for showing me that, when need be, we are all able to sail out and retrieve our lost soul.” The paintings of Miroslav Pomichal also reference the boat as a metaphor for haunting with the story of a maid who is chased by the ghost of Bratislava along the Danube, in a metaphor for the fluidity of faith, nationality and geography in Central Europe. There are some practising shamans alongside the artists here. Kate Walters describes the dream that caused her to make the work she created in Shetland, with Rorschach-like colours: “I had a big dream where I saw myself in a disembodied uterus, floating in space. The next day I felt extremely disorientated, and in the days that followed, I tentatively began to work with the images from my dream, and to write about them. Everything I saw and experienced on Shetland helped with this process. I experienced a profound change in my working practice, and the way I applied materials. All the ghosts of my past (lives) came into my work, and the ghosts or subtle beings I felt around me. I worked with an Arctic tern I’d found, also a lamb’s face on a hillside, with tiny blue eyes still intact. 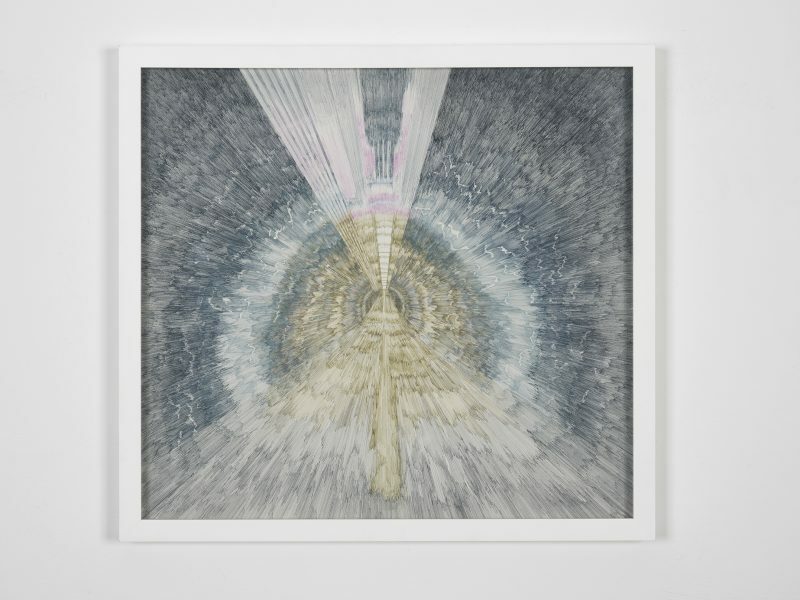 Subtle bodies, archaic sensing antennae, energetic wombs and the slipping into the bodies of other creatures became part of my working field.” Shamanic paintings also feature in the trippy visualisations of David Leapman, to guide the viewer on their life’s journey toward the realm of the dead. Mary Yacoob returns to the ambiguity of the Woolwich foot tunnel at the start of this essay with her drawings which try to evoke the imaginary (or not) time anomaly in the tunnel. Sarah Sparkes – also exhibiting The GHost Library and The Ghost Formula – which I curated at FACT Liverpool and the National Taiwan Fine Art Museum says about her experiences in Taiwan: “When I asked people if they believed in ghosts the majority would resolutely confirm that they did. However, when asked if they believed that the existence of ghosts could be proven through scientific means they were equally clear that it could not. It does not matter if ghosts’ existence can be proven, what is of interest to me is that they exist in our cultures – the living need ghosts, the living make ghosts”. I think this logic can equally be applied to the creative urban myth of the time anomaly in the foot tunnel. Finally – do the curators think ghosts exist? Sarah Sparkes: “I have had encountered ‘ghosts’ during grief hallucinations, hypnopompia and sleep paralysis. In these conditions of mind, I have seen things that appear to have initially manifested from the external material world, but which I know cannot be there. A phenomena of the mind, they rapidly recede when full cognition returns. These visions haunt me, the dead, as yet, have not.” Monika Bobinska answers by relating her experience to London itself: “I also feel a bit like a ghost myself when I visit parts of London or elsewhere where I used to go, and I find them changed, and can visualise/superimpose myself and friends etc. there in the past. I feel invisible, as I am experiencing something quite different from the people who are going about their habitual activity”. 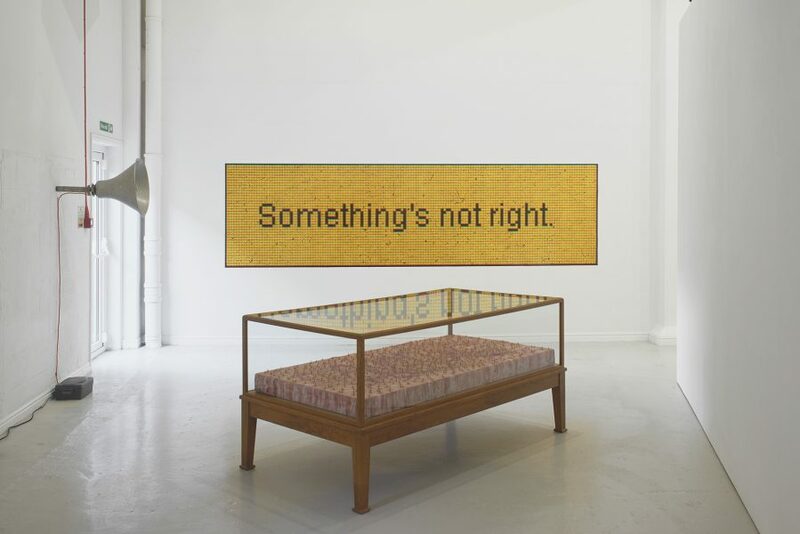 Or, as Patrick Wright puts it in his text greeting the exhibition visitor “Something’s Not Right”. The Ghost Tide also reminds us that here is another kind of ghost haunting London – the ghost property. The overblown, over-financed, over-priced edifice of London, with its hundreds of thousands of empty properties bought and sold by the offshore underworld of international intrigue, tax havens and dirty money, bracing for the ill winds of Brexit, may crash like the Tower of Babel, but the magnificent Thames will ebb and flow as it has always done, bringing back and forth with its ghosts, myths and drowned souls for eternity. 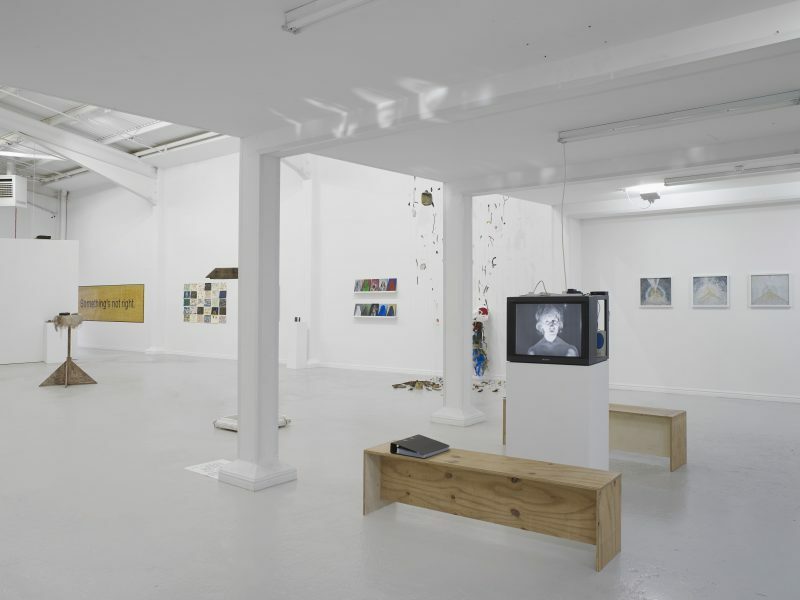 Rob La Frenais is an independent curator.